A crowd a few dozen strong gathered outside Saeima January 22 to voice opposition to the proposed new government coalition. One of the picket organizers, Netherlands-based Marite de Bruin, said the demonstration was against a Krišjānis Kariņš government: "The event was called because the Latvian people have the right to express their thoughts and positions about what is happening now in the process of forming the government, as well as about the economic situation in which Latvia finds itself. That's why this demonstration is happening... it's also against the formation of a Kariņš government. Because a party that got support from only 5% of the electorate should not have the right to form a government." In fact, two previous attempts were made to form a government by nominees from larger parties: first Jānis Bordāns of the New Conservatives and then Aldis Gobzems of KPV LV. Both failed and Kariņš was turned to as a candidate from a smaller party who might be able to persuade larger parties to work together - an effort which appears to have been fruitful. de Bruin denied the picket was an official action of the KPV LV party - which is included in the proposed coalition - though she admitted being sympathetic to that party and Gobzems addressed the crowd, thanking them for turning out. 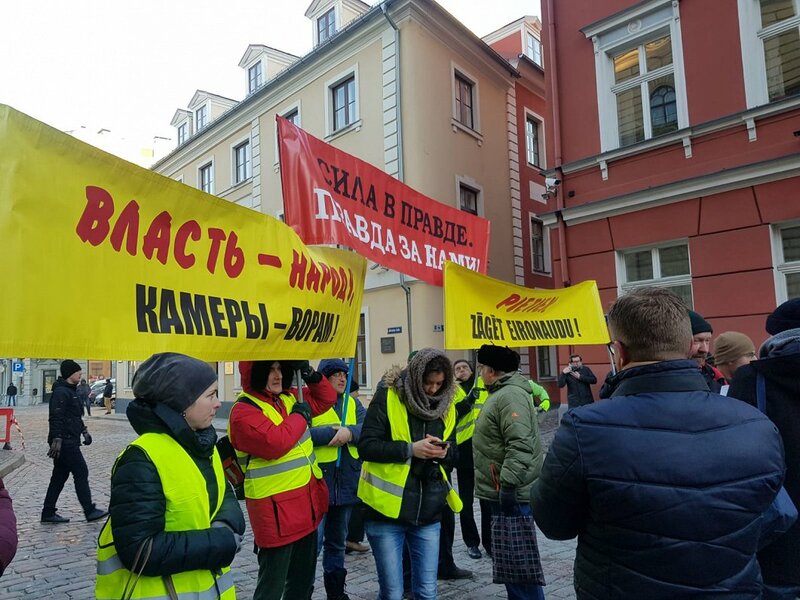 On social media it was also suggested the demonstration was to show support for five rebel members of KPV LV (Aldis Gobzems, Didzis Šmits, Linda Liepina, Karina Sprūde, and Iveta Benhena-Bēkena) who have refused to back a Kariņš government. It remains to be seen whether this develops into a full-scale split within KPV LV ranks or the formation of another parliamentary faction (for which a minimum of 5 MPs are required). Curiously, one of the other stated purposes of the demonstration was to object to the appointment of ministers who had not been elected in the Saeima election of October 6 (there is no compulsion under the Latvian constitution for ministers to be elected) even though, during his attempts to form a government, Gobzems had proposed a cabinet made up entirely of non-elected "experts" which he never, in fact, named. 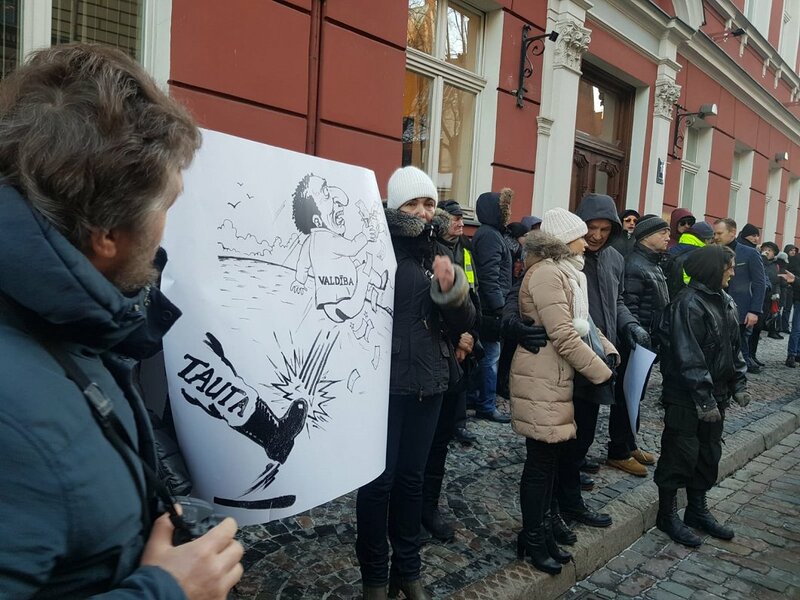 The crowd held up various banners in both Latvian and Russian, one of which appeared to be in highly questionable taste, being based upon a notorious anti-Semitic meme with a few details changed. Saeima is due to vote on installing a new government January 23.